Beef shank or brisket are traditionally used, but a nice marbled beef chuck would work as well. The beef becomes so tender in this dish, and the broth is full of intense flavor. A heartwarming soup for cold, rainy days. 1. In a large pot, add 3 liters water, leg bones, beef tendons, quartered onions, black pepper and salt. Bring to a boil and simmer for 3 hours. 2. Once cooked, drain the liquid and put aside. 3. Separate the boiled tendons and carve any ligaments you can get from the bone then set aside. 4. In a pot, add beef brisket and cooked tendons, Lee Kum Kee Premium Soy Sauce, Panda brand Oyster Sauce, brown sugar, ginger, 1 liter of beef stock and salt (this should be a bit salty). Bring to a boil and simmer for 1½ hours or until the beef is really tender. Liquid should be reduced by then and the tendons should make the consistency thick and sticky. 5. In a separate pot, boil the remaining beef stock together with the onions, pepper, toasted garlic and patis. Turn the heat off once the onions are cooked to the point of disintegrating. Using a strainer, drain and reserve the liquid. 6. In another pot boil water and cook the noodles for 3 minutes. Drain then rinse with cold water. 7. 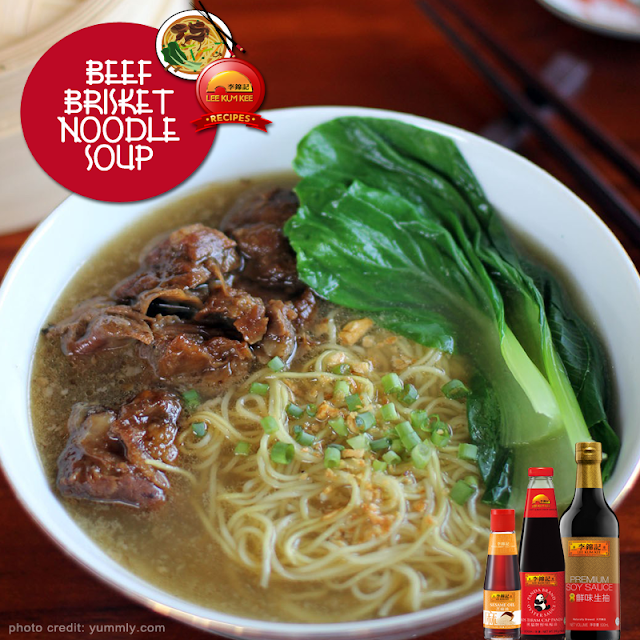 In a bowl, place noodles and bokchoy, then add soup, 2 scoopful of the brisket with the sauce. Top with ½ teaspoon of sesame oil, 1 teaspoon of toasted garlic and 1 tablespoon of chopped green onions. Enjoy while it’s hot!